Cha Am beach in Thailand is famous amongst Thai people for it's long stretch of white sand, said to be the longest in Thailand. Located on the Thailand's sunrise coast of the Gulf of Siam it is relatively unknown for western tourists, but has long been a favorite place for Thai families to spend their weekends and summer holidays. 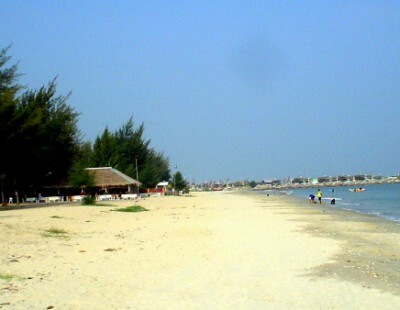 Cha am beach is a 2 1/2 hour drive south of the capital Bangkok. This is very popular spot for local Thai's who are looking to escape the heat of the City. The busiest times are on the weekends during these busy times the beachfront can be rather busy. During the week however, the beach is often very peaceful! There are also plenty of attractions at Cha am apart from the beaches. The area around Cha Am and Hua Hin is famous for it's golf, with six world class courses in the area, including Thailand's first Golf Club "The Royal Hua Hin". A "must visit" are the Thai Royal Palaces that have been built in the area, the nearest of which is just 5km from town. If nature is your thing, you can visit the nearby Kaeng Krachan National Park, Thailand's largest! Also, like most places in Thailand there are plenty of Temples for you to explore. As for accommodation in Cha Am you can choose from cheap guest houses which are available off the beach road for just a few hundred Baht a night. Or live it up at one 5 star luxury Beachfront Resort. The best way to travel to Cha Am is by speedy minibuses from Bangkok or you can take the slightly slower buses and trains. Either way, Cha Am is a great place to stop on your travels through south Thailand and a slice of the real Thailand that has been lost in most other Thai beach resorts.